Art = Life at R.L. Delight Fine Art: 30 in 30 Challenge: Day 15! This is going to be a longer post than usual so grab your favorite warm beverage and make yourself comfortable. I have a couple of milestones, an overdue announcement, and interesting tidbits on a historical seascape artist. 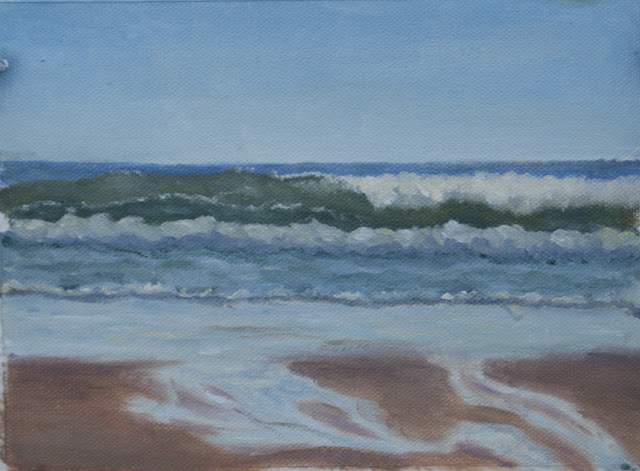 First today's plein air wave study. The cold sunshine continues, in fact will be hanging around for a few days due to a stalled system/inversion layer. No winds! That is both good and not so good. I had a difficult time in wanting to get out and paint today. I think I am just very tired. The events of the past month have piled up and I need a bit of a rest. That said, I also really want to complete this 30 paintings in 30 days challenge. I will do what I can even if it means taking a day of rest and painting two on another day. I was painting a wave study and a finished painting in one day when I first started the challenge so it is doable. The sun is out but the waves are very small and to me, not very exciting. One of the reasons why I started my wave studies this fall is the waves are more interesting during the stormy seasons. I decided to minimize the waves, which were minimal already and paint the more interesting part of the sand. There are several storm runoff drains that empty onto the beach. Some of the streams are natural and some are human made. These can get fairly deep and treacherous this time of the year with the far-reaching tides. At the moment, they are quite small as we haven't had rain lately. They have their own beauty and I liked the reflections of this natural seepage meeting the sea. I will need to practice painting them more to get a better likeness. So here are the milestones: Day 15, half way through the challenge! This is also my twentieth wave study which means I take another picture of them all together. Five more and I will be a quarter of the way through my goal of 100! Ahem, a while ago, before the New Year, I promised to make an announcement at the first of the year. Of course, the end of the old year and beginning of the new ended up being rather strenuous and distressing and, then this challenge started. I put off making the announcement until I had a chance to think a bit clearer. Of course, some of you have probably already guessed it and the rest will certainly have seen it coming. Three years ago I entered studies at the Ashland Academy of Art with the intention of being there for four years. I would have been well into my fourth and final year if things had worked out. Life being what it is it didn't and we ended up in this beautiful rugged spot on the Northern Oregon Coast. I resolved to continue my studies on my own, and I have. I have always had a pretty good picture of where I wanted to go with my art but unbeknownst to me, there was one critical piece that needed to fall into place at the right time and space. Actually two pieces, the wild beauty of this area which re-awakened my passionate love of nature, in particular my love for the ocean, and painting en plein air. Suddenly the light came on and my life; past, present, and future, realigned. I am now dedicating the bulk of my art career to being a marine painter. I still will continue to build my figure and portrait painting/drawing skills but my heart, and my art, is in painting the coast of the wild Pacific Northwest (and other points around the world!). I have a lot to learn still. At the moment, I am self taught in both oil painting and plein air painting (my year at school was spent learning the critically important skill of drawing). By self-taught I mean I have studied and learned from books, DVD's, and the wonderful information online in addition to just plain picking up the brush and painting. I plan to take a workshop or two once I can afford the cost. I would love to take a workshop from Don Demers for example. I have a short list of artists I would like to learn in person from. Fortissimo by Frederick J. Waugh, 22"x29.9", oil on panel. This particular photo and the following information was excerpted from Armand Cabrera's Art and Influence Blog. The link will take you directly to his article. I won't quote the entire article series but here are two quotes from Waugh that resonated with me. "I both paint from the sea and watch it carefully, and the later way of studying I am sure is invaluable." "Waugh always painted from direct observation, but these studies were not for sale. Instead, Waugh used the studies, along with his memory of the experience to create finished paintings in the studio"
Of course all of it was of importance to me but most of the quotes pertained to painting method. The blog is definitely worth reading if you are interested. There are three posts which are nicely categorized under Fredrick Waugh's name. These two quotes make sense to me because this is what I have instinctively done. I truly believe there is no substitute for learning and painting from life. This is what I believe for me personally. I know others use photo references as I have, twice, in my work. I have nothing against photo references and know that sometimes they are necessary. I just resonate with painting from life. The second quote made me smile because this is exactly what I am doing. Nice to know I am following in the footsteps of such a great painter. I could go on and on but I will spare you all. Needless to say, I want to grow up to be the next Fredrick Waugh! Of course, there are already some pretty incredible contemporary seascape artists out there but this is the exact style of realism in seascapes I am aiming for. One final point I would like to mention. The artist who sent me the great tip and encouragement today is Renee Lammers. I have mentioned her and her wonderful paintings on copper on this blog before. Her website is well worth checking out. Not only would I like to meet her in person and paint with her in Maine some day, but I am saving up to buy one of her paintings. Not to make you blush Renee, but you are generous and hard working and I am happy I found you on Facebook! Phew! This is a long post but a lot needed to be said. Tomorrow's post won't be so long. To my wonderful friends who read this blog and to those who also comment on my blog posts, every single one of you, thank you! I appreciate the comments and will be commenting more on your blogs when this challenge is finished! Renee there's nothing as motivating as having a clear picture of where you're heading. Congratulations on your clear vision and resolve! Life does have a way of taking you in directions you wouldn't have foreseen. I'd have loved to have had the opportunity to go to art school. I knew from the time I was 6 that I wanted to be an artist, but art school wasn't to be. I've learned in the same way you are learning. One word of advice - It's very slow going. If you have the means to take those workshops, take them. And take the advice all teachers seem to give - Paint,paint and paint some more! Thanks Theresa, it is indeed slow going but I expected that. I have had two workshops but, after being spoiled by year round schooling with a very small amount of students, they were disappointing. Of course I learned but for the cost, wasn't sure it was worth it. I am a good self-learner and highly motivated. That said, I will eventually take a very carefully selected workshop or better yet, a 6 or 8 week course. One day.